Further to our post earlier this year – sadly little Talia (pictured) is not THE red heifer which is eagerly awaited. Rabbi Chaim Richman of The Temple Institute gave the following statement and Jacob Prasch gives some deeper teaching about the significance of this beast on the Red Heifer DVD. 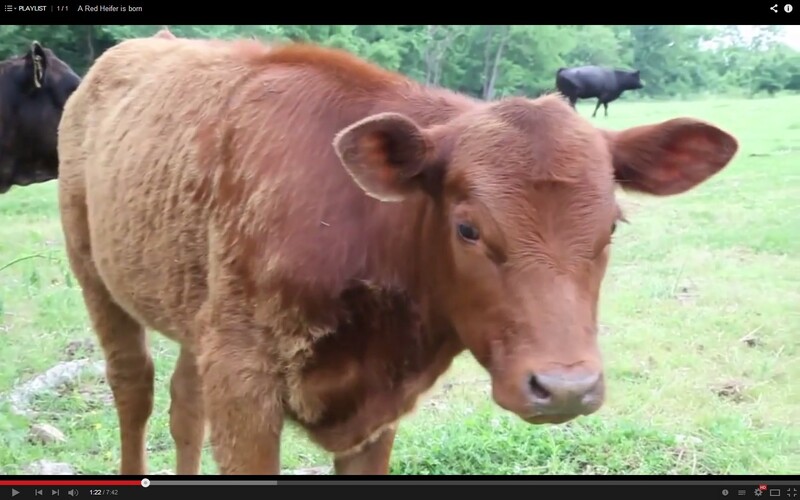 “Several months ago the Temple Institute was delighted to announce the birth of a perfect red heifer in the USA. This heifer was a proper and fitting candidate for the ‘ordinance of the red heifer’ (Numbers Ch. 19), which is a prerequisite for the restoration of purity and the ultimate resumption of the Divine service in the Holy Temple. The heifer was born to friends of the Temple Institute, who promptly notified the Institute and communicated their intentions to raise the animal in strict accordance with the requirements of Biblical law and ultimately, to donate the heifer to the people of Israel through the Institute. The news of the red heifer’s birth generated tremendous interest internationally and created palpable excitement for many who understood the historical and spiritual significance of the event and its propitious repercussions for Israel and all mankind. The Temple Institute began to make preliminary arrangements for the shipment of the heifer to Israel, as well as provisions for the heifer’s care upon arrival. Unfortunately upon recent inspection it has become clear that Talia, as she is affectionately known, has become disqualified for use for the ordinance of the red heifer and is now unfit according to Biblical law. This is on account of a change of pigmentation in a patch of skin, as well as the appearance of white hairs in the affected area. Changes of this nature are not uncommon occurrences in the bovine world as a heifer matures, a fact that contributes to the rarity of finding a perfectly pure, kosher red heifer. But it can happen, there are perfect red heifers out there, and with G-d’s help the Temple Institute shall continue its search and locate operation. We know that the heifer needed to re-establish purity is out there, or on the way. We ask our friends to keep an eye out, and keep us informed! The past few weeks of planning for the red heifer with our friends in the USA has been a very productive and important experience, in which the Institute geared up for what became a ‘practice drill,’ and in retrospect it is obvious that this was a Divinely-orchestrated episode which has enabled us to become more prepared and better equipped when the red heifer project becomes a reality. We take this opportunity to thank Talia’s owners, whose great modesty and righteousness prevents them from seeking any public acknowledgment. The Temple Institute also takes this opportunity to thank another dear friend who acted as our trusted liaison, and pledged to contribute the costs of transporting the heifer to Israel.